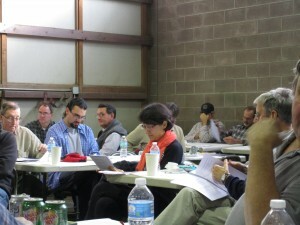 Cornell’s annual “Show and Tell” about advanced potato selections was held on Friday, December 9th at the Plant Breeding Field House. Following the traditional lunch time gathering featuring potato-based dishes and pie, Walter De Jong, potato breeder in the SIPS Section of Plant Breeding and Genetics, described an assortment of advanced selections based on Cornell trials in 2016 and previous years. Thirteen clones were described in detail with attention to yield, size, and color. De Jong emphasized that for table stock potatoes, the three top traits continue to be, “looks, looks, and looks”. The clones were also reviewed for disease resistance and incidence of features that can reduce marketability such as growth cracks, hollow heart, and high levels of glycoalkaloids. Among the topics discussed were whether niches exist in the current market for new potato clones, especially when there are already an abundance of good chippers and round white potatoes. De Jong mentioned that in some cases new clones are given to smaller growers as a “stealth strategy” for evaluating potential marketability. Potatoes rank number one in economic value among vegetables produced in the state, with 55% used for table stock, 40% chipping, and 5% seed. Given the importance of the chipping market, clonnes are routinely evaluated for chipping quality. De Jong commented that in national evaluations, New York potatoes have consistently rated very highly in this regard. A theme that emerged for both table stock and chipping potatoes was the growing market for smaller size tubers. The so called, “1-bite 2-bite” table stock potatoes are increasingly popular for their convenience and reduced calories compared to the traditional baked potato. The move toward single serving packaging for potato chips has also increased demand for smaller potatoes that are also good chippers. 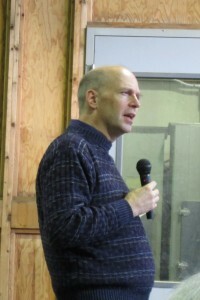 In his attempt to balance the many qualities that growers and consumers seek in their potatoes, De Jong acknowledged “I have to live in the real world and realize there is no perfect potato”.